More amo for those people who think Asus might have lost their way slightly since their triumphant Eee PC days. 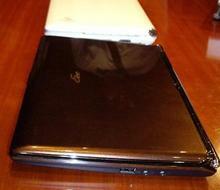 This is a prototype for the S101, which has been branded the “ultimate Eee PC”. But rather than embracing the Eee PC’s key selling points (i.e. its low cost) in this ultimate version, it seems to ignore them. It’s super thin, at 21mm thick, but features the same Intel Atom processor. However, this one is premium and is so going to cost a fair wack more than the original. – up to $699 for the 64GB SSD version.